Should we harvest sea lions? Recipe – Salmon with salad and edible flowers. 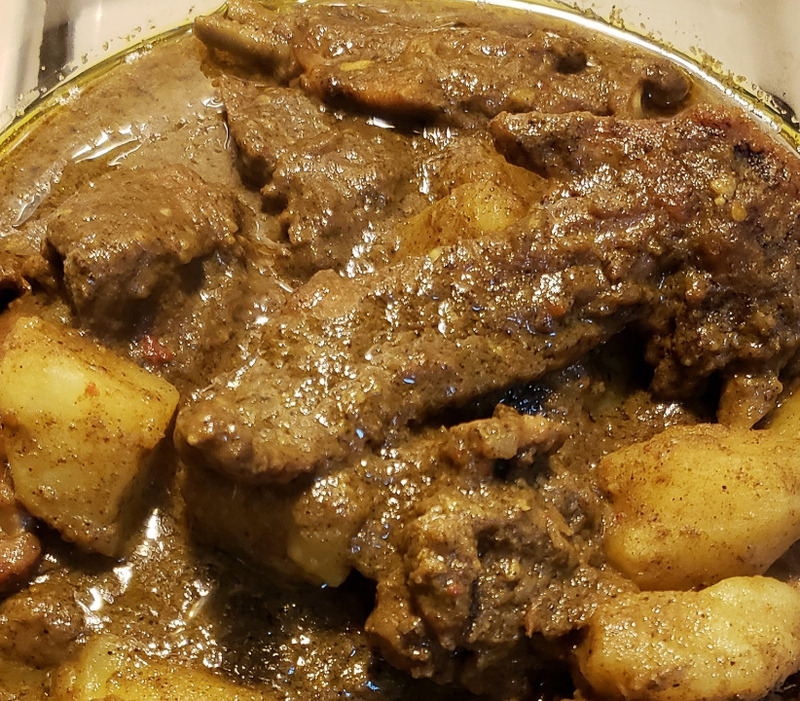 When I cook, I feel my Guyanese people, my birth country, my family. For me family time starts the moment I step into the kitchen. Roxanne Bettencourt, a proud New Yorker, is renowned for her cooking skills. Many friends and family members gather in her kitchen to eat and reminisce about their growing up years in Guyana. She knows how to sooth their hearts and tummies with her mouthwatering Guyanese cuisine. Roxanne is not only a native New Yorker, she is also of Guyanese heritage. Her relationship with the local ingredients of this lush and vibrant country influenced her from a very young age, which set her on the path of seeking out the best ingredients for her creations. Her food is wholesome, healthy and downright comforting for anyone missing their Guyanese “small days”. Living in New York allows her access to the best of the Guyanese ingredients she needs to make, and store, her own condiments and spice blends. Roxanne also grows the many Guyanese herbs and peppers she needs for her recipes, herbs like Thick Leaf Thyme, Married Man Pork, and Wiri-wiri peppers. When did you acquire this passion for cooking? My relationship with food stared at a very young age, my stepfather and brothers were all fishermen, that’s probably why I love seafood so much. They would bring the catch home in the mornings and we had to clean the fish and shrimps and get them ready for market. It was a natural progression from cleaning seafood, to cooking in the kitchen. What was one of the first things you learnt to cook, and how old were you? I was about seven years old when I was expected to help with the daily catch, and the same age when I started in the kitchen. I remember my first attempt at making roti. Guyanese roti takes a few steps to make, first we have to mix it, let it rest, then roll it out and cook it on the Tawa, which is a flat cast iron griddle. The last step in the process is we have to clap it to soften the bread. Well, when I attempted to clap the hot roti, it flew out of my hands, right out the window (laughter). That is very young to be responsible for dressing seafood and cooking, did you rebel against that? Gosh no! I loved it all, although they were chores, and we had to do them, I actually found pleasure in working with food. I really enjoyed it back then and even more so now. Especially because I can appreciate the work that goes into harvesting and cooking food. How old were you when you moved to New York city? I remember that date exactly, I always will. I was seventeen years old and prior to moving I had spent a few carefree teenage years in Guyana. Like any typical teenager, I was having a blast, life was beautiful and I was invincible (reflective smile). Right, the date was September, 18th, 1981. There I was a bold teenager full of spirit when my family picked me up from the airport. But literally within 2 or 3 hours of that moment I was thrown full blown into life, grown-up life. That same evening, one of my older sister was rushed to the hospital and I had to take care of the kids. The next day I was registered for classes, and found a part time job. Shortly after that, my eldest sister moved back home with her kids. At this time, my mom was in college getting her Social Work degree. Being the youngest, I had to clean the home, babysit the six children, and cook for the family. All while attending classes and working part time myself. I worked harder in New York than I had ever done in my young life. Have you ever worked in the restaurant industry? Yes, this was when I was about 27 years old, married with a young daughter. At the time, my husband’s sister owned a Trinidadian restaurant and we were asked to help out. We ended up taking over the restaurant. Again, it was an insane amount of work, but I loved it then, the challenges of running a restaurant is not easy. We had to deal with the city, suppliers not showing up, normal kitchen issues that seemed to be unending, which anyone in the industry can relate to. Staffing, and a million other issues. I did it with love for eight years but then I had to step away because one can get burnt out in that industry. Are you proficient in cooking Trinidadian food? Oh yes, but as a Guyanese with a passion for our food, I quickly started incorporating Guyanese dishes into the menu. What sorts of dishes did you add? Really it was just a matter of changing a few things and making dishes the way they are made in Guyana. I replaced Pelau with Cook-up Rice, Blood pudding with Black Pudding, and so forth. The restaurant thrived for it, people loved what we were doing. Of course, that was because Guyanese food is my passion. I am a big fan of Guyanese Chinese food. Are you a fan, and do you make the chicken on top part too? Absolutely! Guyanese Chinese is the most special kind of Chinese for me. I think it is because our Chinese recipes are handed down for generations, and there are a lot of tropical ingredients in the dishes. I do cook Guyanese Chinese food quite often, for example the chicken is lightly salted and deep fried whole for the crispy skin, moist meat textures, then the whole chicken is chopped into pieces to place on top of the Fried Rice and Chow Mein. You travel quite a bit following your passion for food, where have you been in the last year, and name one takeaway dish you would like to recreate? Let’s see, I was in Barbados and I will never forget the grilled fish, rice and salad I enjoyed at Oysters restaurant, which is right on the water. That is definitely in my top 10, I mean it was an entire fish, grilled with all the sides for only 40 Bajan dollars. The Rockies, in Banff. Now that place is a slice of heaven! I loved it there, I had the best BBQ ribs there and the freshest grilled salmon ever. Wow, I loved it there. I was just in Greece on a sailing trip and everything I ate there, I would like to recreate. The slow roasted leg of lamb that is so unique to Greek cooking. The fresh mussels, the Shrimp Saganaki. Gosh I love the Mediterranean diet. And Toronto, I visit quite often and when I am there it is all about the sushi made with fresh salmon and seafood, And of course, Hakka Chinese. I can’t even begin to describe what I feel about these two cuisines (laughter). What is the one weird thing you do when you travel? I sneak around watching the cooks, even if they don’t invite me. I love that, I enjoy watching others create food. What’s new and happening in your kitchen these days? Well, I used to have dinner parties quite often, so I may be relaunching that. Right now, my good friend, who is Thai, is teaching me Thai cuisine. She is very good at allowing me to pick and choose ingredients and playing around with my own versions and combinations. I definitely am enjoying this phase of focusing on Thai food. What do you feel when you cook? Tell us a bit about the recipe you are sharing with us today. This Chicken Curry is most definitely one of my favourite comfort food, there are a few ways to prepare this dish. Today I will show you the easier way to do it, plus how to cook it in your slow cooker. Tip – For me, I love the easiness of cooking, the simplicity of it. It helps if some marinades are prepared ahead of time, like my Green Seasoning. Green Seasoning can be made a hundred ways, but the simplest one is to take a bunch of green onions, 1 medium yellow onion, 4 cloves garlic, 1 chili pepper, and the juice of 1 lemon and 1 bit of salt. Puree it all together. Transfer to a glass jar and keep in the fridge for regular use. I will share my recipe next time, I use nineteen ingredients in mine and I make it by the litre. Squeeze the lime and sprinkle the salt on the chopped chicken, mix well and let it sit for 10 minutes. Wash well and drain. Place the completely drained chicken pieces into a deep mixing bowl. Add the green seasoning, curry and spices, mix well to coat every part of the chicken pieces. Set aside to marinate for 30 minutes or so. Alternately, keep in the fridge overnight and use the next day. Pour the fats into a deep saucepan or crockpot, and bring to a high heat. When the fats are very hot, add the marinated chicken and stir constantly to sear the meat and roast the spices. Lower the heat and let the chicken brown well until cook through, This part requires diligence; stir often to avoid burning. Add the potatoes, pour in the liquid to cover the potatoes (just barely cover the potatoes, adding too much liquid will water down the sauce). Cover and let it cook over medium heat until done. To thicken the sauce, take a few pieces of the cooked potatoes, mash it well and return to the chicken curry. Stir well and remove from the heat. Leave the lid on, let it rest for a few minutes while you prepare the sides. Serve with steamed rice, a quick greens salad, and a few slices of green apples for a crisp and refreshing crunch. Slow cooker version: Add the spice-marinated chicken, the potatoes, and 2 cups low sodium chicken broth to the slow cooker. Set to the low setting in the morning before you leave for work. Enjoy a delicious ready to plate dinner when you return home in the evening. Can you guess this location? Samantha McLeod is a travel and food writer based in Vancouver. Her work has taken her across Asia, Caribbean, North America, South America and Africa. She has a curious nature for searching out and documenting new places, spaces and food. ‘Sam’ is also an avid photographer whose work on sustainable foods, and adventure travel has been internationally acclaimed. Sam does not only promote the merits of healthy and sustainable living and freedom in travel. She breathes it and helps others live it with her global culinary adventures.